What is wrong with instant online website builders, if we are to believe the accusations? Is it a case of rival designers defending their turf? Is there a valid argument behind the idea that businesses have no serious future with the likes of Wix and similar platforms? Small businesses with low budgets often begin their online life looking for solutions that are either cheap or easy. Many understand they need more than a Facebook page but do not want to commit to anything much more complicated or time-consuming. While there are dozens of dedicated online instant site builders on the market, opinion on their quality is divided and users of such platforms might not be get what they need even if they get what they want. Print shops and domain/hosting companies are known to provide these types of services too. Anyone researching web design has a choice of hiring someone or doing it themselves with the numerous hosted site builders. Sole traders, in particular, are attracted to the “free” versions of such platforms because they think they’ve scored a remarkable coup by not having to pay. I’ve blurred the name of the business in the screenshots below to save any embarrassment. Perhaps this site is producing results and generating enquiries, but in a more competitive niche, it almost certainly won’t perform when up against professionally designed sites. Typical Wix website: free and poorly designed. Click to enlarge. So far the digital marketing strategy consists of a slapped together website using a free Wix subdomain and a few photos. Sorry [business name removed], but I just don’t believe your “highly professional” claims. If that’s your idea of good marketing, I’m not sure I trust you to wire plugs or change light bulbs. 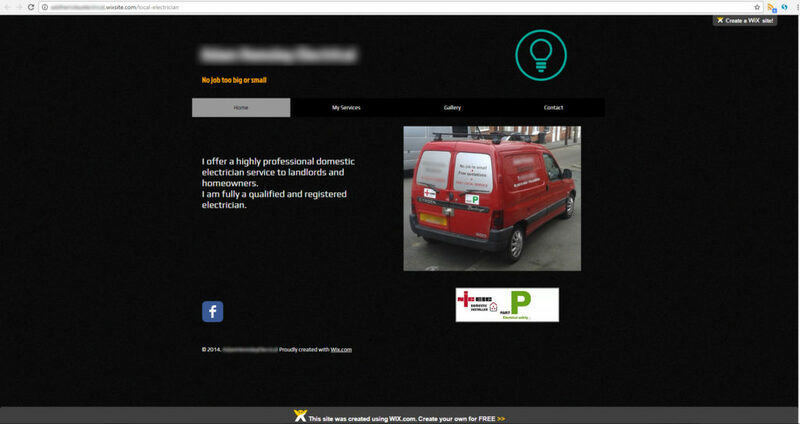 “This site was created using WIX.com. Create your own for FREE” doesn’t exactly help the business image. Is the owner is strapped for cash? What Do Businesses Want in a Website? The issue seems to be that a small or local business with little to no budget becomes comfortable with their DIY Wix site. See it from their point of view: for all intents and purposes, they’ve got a public website up and running and this newly minted webmaster doesn’t want to change. Broad appeal, ease of use and price are strong motivating factors for the novice webmaster, yet it seems accessibility and user experience barely register in the order of priorities. Assuming the business owner classifies themselves at “not very technical” it’s safe to say digital law, legislation and compliance are unlikely to be heeded by an individual who only uses a computer under protest. They care little about the finer points. 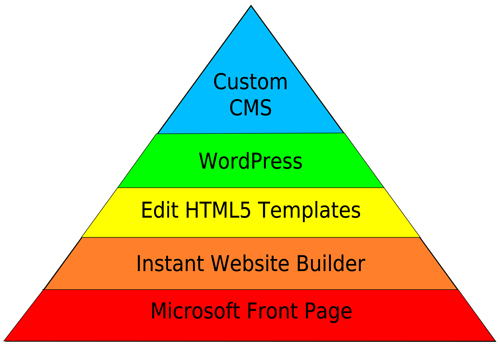 You might argue that web design requirements are loosely based on Maslow’s Hierarchy of Needs, with “Custom CMS” at the apex and the likes of “Wix” nearer the bottom of the triangle. This has been my web dev order of priorities. It may change. What are yours? The needs fulfilled by the more primitive software would be equivalent to baser instincts; just being able to get something online is the primary concern of the average business owner with average or below average design skills. New website visitors form their opinions on design and what it says about the business in less than 1 second. In that time, they make judgments about credibility, professionalism and quality of information without reading a single word you wrote. A potential new client looking at your site for the first time will be consciously and subconsciously looking for certain indications of trustworthiness. If the site you present looks as though it was hastily put together, it sends the message that you’re the type of person who cuts corners. Not good for any business. Think about what your customer wants and expects before deciding to contact you. Google Trends data reveals Wix is more popular than Weebly and Yola. It’s not surprising given the regular advertising campaigns brought to bear by Wix, such as the 2015 USA Superbowl “It’s that easy” campaign as well as all their text and video Adwords campaigns. The graph data exhibits a particular pattern of peaks and troughs, suggesting the website creation market has some seasonality to it. It appears site builders get high interest in January (enthusiastic about a new site) and least interest in December (too busy, other priorities). One thing is obvious; site builder platforms are increasingly popular. When I started building hobby sites around 2000, I used Homestead and Geocities site builders. The pages were messy… barely functional in some cases. Site builders changed a lot over the following years. They did get better and continue to improve. In 2010 I purchased the middle priced annual tier of a fully hosted drag and drop system called Yola, which, for a while, served the needs of myself and the clients I had at the time. While those sites weren’t terrible, there was much to be desired. 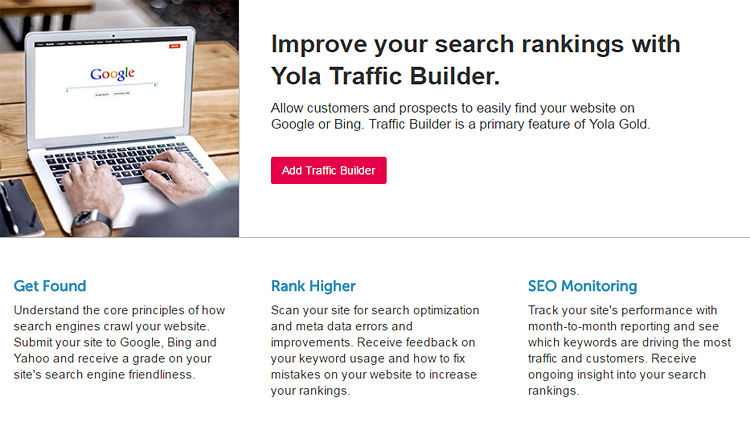 The logistical demands of my sites began to push Yola beyond its capabilities. Simple changes took hours. Advanced functionality was complicated or impossible. It felt like playing with Duplo when I was crying out for a big box of Lego Technic. What’s more, the bloated code in Yola webpages defeated the point of having a CSS stylesheet. Inline CSS styling is seen all the time in web pages produced with instant site builders. There is too much code because of the manner in which objects, elements and media are added. For example, rather than adjust a margin value in the stylesheet once, you’re obliged to add and edit individual elements on individuals web pages. Changing the values in this way takes too long. On larger sites, it’s a nightmare. Inline CSS makes editing pages difficult. Inline CSS rules override the stylesheet. When you work with a stylesheet without the restrictions of a site builder, you can organise CSS rules using comments to annotate it. It’s so much easier when you comment your CSS. Apart from improved use of code, I developed advanced strategies outside the remit of Yola. I stopped working with clients who had already built their sites using a site builder and wanted help “improving” it. This was back in 2012. There was a Google mobile search engine algorithm on the way. It was a good time to ditch instant site builders and began learning software that offered greater control and customisation. 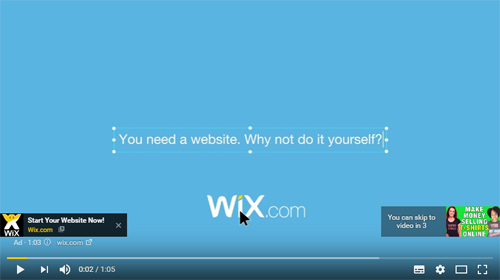 Wix advertises extensively on YouTube. They make attractive propositions with vague allusions to “search engine friendliness” while waxing on the idea that businesses are too busy to learn web design but not busy enough to be able afford to pay someone to take care of it. Most site builders have paid upgrades which, apparently, do all the heavy lifting in design, development, search engine marketing, traffic generation etc. Push a button and the problems go away! Instant results! It turns out this fellow was spending considerable time and money on a Yola eCommerce store with absolutely nothing to show for it. Furthermore he had been persuaded to use an automatic web directory submission tool sold as a paid upgrade to his Yola Gold account. This is a terribly misleading product for novice website builder business owners. If you have no marketing strategy and few ideas, don’t get upset when the cheap tools you’ve thrown money at don’t give you the shortcuts you were expecting. Today, WordPress.org is a popular website solution among small businesses. It’s free and open source, meaning that WordPress is open to everybody to use, modify and distribute. Themes or plugins are created for others to download either for free or as a paid product. There are associated costs like hosting, domains and email plans. WordPress accounts for all different types of websites, and is searched 2.7 million times per month globally. With a market share of 60%, it powers 27% of the internet. Those stats will steadily increase, but so will the Wix stats. Let’s add WordPress as a search term to the Google Trends graph from earlier on. As you can see, it dwarfs Wix. The problem with WordPress is the amount of crap in the theme and plugin repository, meaning a large influx of unskilled webmasters are creating insecure websites begging to get hacked. In a study WordPress came out on top as the most hacked platform when compared to other platforms in the market, but it should be pointed out that as the market leader, those numbers are bound to be higher anyway. The Panama Papers Breach was a result of an outdated WordPress site running an outdated version of a slider plugin called Revolution. By contrast, I’ve never even heard of an instant web builder platform getting hacked. Wix, Yola and Weebly, to my knowledge, cannot be hacked. WordPress also falls down with its editor. You have to go into the back end of your website and compose content in plain text or code view, then save and preview it. Wix does a better job of showing what you’ll get up front and allows you to position elements anywhere on the page, but this seems to affect the mobile viewport layout across devices. Another disadvantage to using website builders is that they technically own your content since it is hosted on their servers. If you violate the terms of the service they can shut your site down and evict you from the digital property you chose to build on rented land. And then there’s something about Wix and code theft. The #Wix Mobile App steals #WordPress' code and violates the #GPL https://t.co/yTxfW0oE2t | @WebDevLaw what's your opinion about this? There comes a point where the digital marketing ideas you want to execute fall outside the capabilities of hosted website builder software. You cannot access important server files like .htaccess which can be pivotal for some strategies. It is a closed system built on rented land. You cannot “move” your site to another host because each web builder is proprietary, meaning you’re marooned on that particular island. However, on balance, it’s fair to say an amateur will do a terrible job with any platform. From the point of view of a sole trader with limited resources, the quick and dirty site builder with clean looking templates has saved the day. It’s undemanding and straightforward. It’s reasonable to say the mature, experienced web developer sometimes feels like the disenfranchised jealous ex-lover. Next time you choose a website platform, choose wisely. Site builders have way to limitations on them. Example: the URL slug (the part after the main domain and trailing slash) are usually predetermined and cannot be changed. I’m working with WordPress now and there’s much more frredom even though it is not a perfect system. Security is the issue since it is built on PHP which is a common web language frequently exploited.